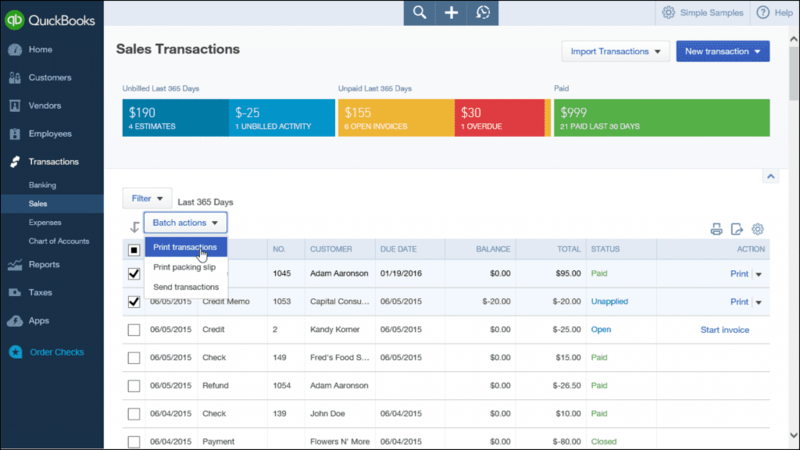 Your first transaction in QuickBooks Online was probably an invoice. But there are many others that you’ll want to know how to use. You probably process more invoices than any other kind of sales transaction in QuickBooks Online. And it’s usually with a great deal of satisfaction that you create these forms, since it means that you’ll be getting paid for providing services or selling products. But there are numerous other sales transaction forms available on the site. Maybe your business is simple enough that you don’t have occasion to use them, but you should still understand what they are and when you should create them. The easiest way to locate these forms is by clicking the “+” sign that appears at the top of many screens. By default, this opens a short list of the most commonly-used transactions. Click Show more to see the entire list. Invoice. Use an invoice form if you want to bill a customer for a product or service for which you expect to be paid for at a future date. You can either print and send these through the U.S. Mail or email them. Receive Payment. This is the enjoyable part: recording a payment – via cash, check, or credit card – that you’ve received from a customer. It’s critical that you deposit these funds to the correct account. If there’s any question, or if you want to start accepting credit cards (merchant accounts are complicated), contact us. Estimate. These are often used for larger – or multi-part – jobs, although, depending on the type of business you operate, you may create them on a regular basis for simpler transactions. When you send an estimate, you’re not asking the customer for money; you’re simply presenting an approximation (or in some cases, an absolute dollar amount) of the costs anticipated. QuickBooks Online reminds you of open estimates when you start to create a new invoice for a customer who’s received an estimate. Figure 1: An estimate is not a bill or invoice. It tells your customer how much you anticipate charging for a requested product or service. Credit memo. This can get tricky. There are several situations in which you’d issue a credit memo, including a pricing dispute, returned products, or overbilling. If a customer has not yet paid, the credit memo will reduce what’s owed. If payment has already been made, the customer can either apply the credit to future purchases or request a refund. Sales receipt. This one’s easy. You create a sales receipt when you receive payment at the same time a customer receives goods or services. Obviously, no invoice will be necessary. Refund receipt. This type of sales transaction records a refund issued to a customer. But there are many reasons why a customer would receive a refund from you. What was the original transaction type? What account should the refund come from? We can go over with you the various possible scenarios when you begin issuing refunds. Delayed credit. If you know a customer is returning a product but you haven’t yet received it, for example, you would complete this transaction form. QuickBooks Online displays this credit in the right vertical pane of the next invoice you create for the customer. Delayed charge. If a customer will owe you money for a product or service or fee at a future date but you don’t want QuickBooks Online to record it yet, you can use this form to track it. When you do create an invoice for the customer, any delayed charges will appear in the right vertical pane. Figure 2: Boxes like these will appear in the right vertical pane of new invoices for the affected customers, and you can automatically add them or open the original form. They do not affect the balances of any of your accounts in QuickBooks Online until they’re included in an invoice. There are so many ways a sales transaction can go, so many variables. But it’s important that you record them using the tools that QuickBooks Online has designed for your financial accounts. It’s difficult and time consuming to fix a transaction that was entered incorrectly at the start. We’ll be happy to go over these sales transaction types in depth or to consult with you on any confusing situations you come across.